think about. It is an automatic body function. An automatic body function that takes place at a subconscious level. However, when you putt, especially under pressure, you need to control consciously how you breathe. In everyday life the respiratory centre of your brain regulates its rate and depth depending on your body's needs at any time. However, you can control it consciously. For example, conscious control is common in Yoga, Zen meditation, and vocal training. Control of your breathing is essential in putting - not only to ensure a smooth stroke, but also to manage stress. If you can't manage this, your putting will be erratic as the putter head will be gyrating during your stroke. Any form of exercise increases the level of carbon dioxide in your blood and this leads in turn to a higher rate of respiration. You use up oxygen faster than you can take it in and your body has to work harder to make up for the loss of oxygen. Inhaling and exhaling during your putting stroke will move your putter off-line. This is because when you inhale there is a downward contraction of your diaphragm in conjunction with your intercostal muscles that contract to lift your rib cage. Exhaling reverses the process. To play golf you need a degree of fitness and stamina. If you are physically out of shape and are still gasping for air when it is your turn to putt, you will be unsteady and your putting will be erratic. To execute a smooth stroke you need to be able to hold still. Our respiratory pattern changes when we are stressed. We take rapid shallow breaths that over-deplete the carbon dioxide level in our blood. This can lead to hyperventilation and a feeling of anxiety. 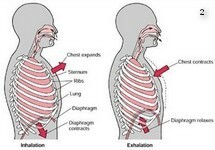 When we are relaxed, our breathing shifts from our upper chest to our lower abdomen. This helps to lower our blood pressure and our heart rate. How to hold still while you putt. Apart from general advice to maintain a level of fitness, you must make a conscious effort to prevent any movement in your diaphragm and rib cage. You can either inhale and hold your breath or exhale just prior to putting. Tom Watson recommends in Golf Digest that you take a deep breath and let it out slowly. Then take another, let it out halfway, hold it, and then putt. He bases his recommendation on a technique used in trap shooting. How to relax under pressure. You have to be relaxed to putt well. The standard advice for relaxation is deep abdominal breathing. This will not only get your mind to slow down, but will help to reduce your anxiety. Another technique to lessen stress is to hum as this is similar to meditative chanting practised by Buddhists. Humming also helps to quieten the internal dialogue in your head. We take our breathing for granted. Normally this is not an issue. However, when you putt you must raise your control over it to a conscious level.